I’ve just finished “MY Salinger Year” by Joanna Rakoff. I was talking to one of my colleagues about books and she suggested I read this book and lent me a copy. It’s about a young woman who starts working at an agency who represents JD Salinger, and she starts off as just an assistant who types up dictations and then she starts getting more involved with the publishing aspect. She also is given the responsibility of reading and answering Salinger’s fan mail. Even though her colleague advises her to just send a standard reply, she’s intrigued by the things his fans write about and starts amending her replies. The book is supposed to be funny, but I didn’t think it was funny, it’s more sad than anything else. Reading about Joanna’s life is interesting because she’s just trying to make something of her self by finding meaning through her job. I can sympathise with her as a twenty-four-year-old young woman who is trying to make sense of the world and grow up – I’ve been there and I felt some emotions bubbling up as I read it. However, I don’t understand why she stays with her boyfriend because she’s clearly left a previous boyfriend behind but still thinks about him – we don’t really find out what exactly happened there, but it’s clear she’s not made a great choice with Don who’s trying to write a book. He does seem to give her a bit of attention but he’s a bit distracted and doesn’t seem the right person for Joanna at all. I’m giving it 6/10 because it did keep me engaged while reading – I read it in two sittings – and it was interesting, but I didn’t love it. However, it’s re-awoken the desire to read more new books, so I’m going to get started on a new reading list! 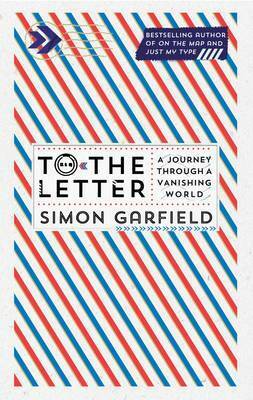 I’ve finally finished “To The Letter” by Simon Garfield, despite being given it for Christmas in 2013 and I started in February 2014! It’s a non-fiction book about letter-writing and how it’s evolved over time. Obviously letter-writing has started to decline as the use of the Internet increased – even emails are now being left behind by social media. The book spends a lot of time talking about letters between noted writers and poets of their time. It’s intersected with images of letters and you can see the differing styles of handwriting. It’s sort of interesting and covers a reasonable amount of history but it took me so long to get through it! There were the odd few interesting bits through it, but the most interesting section was the last one where Garfield talks about the Internet taking over! However, I quite enjoyed the letters printed through the book between the solider Chris and his sweetheart Bessie during their seperation during the Second World War: they seemed genuine, less pretentious and more realistic than some of the others mentioned in the book (especially the ones between famous writers). I’ve always quite liked writing letters: it feels more personal and more structured than emails. I always felt more honest by writing a letter, maybe that’s why love letters work so well. It’s sad that we don’t write letters so much any more and it’s becoming a lost art, as Garfield says. As a result, I thought this would a be good book to read and I was excited when I was given it. It’s just a shame I didn’t massively enjoy this book: it’s rather dry and dull, especially in the first half. I probably wouldn’t read it again because the reality is that it’s just not that “witty” as promised. I’m not sure why people have raved about it?! I’m giving it 5/10 because it had some good bits but the fact it took so long for me to plough through it has put me off! I recently read “Northanger Abbey” by Jane Austen. I thought it was going to be like the other Austen novels I’ve read and take me ages to read it, but I was wrong – I went through it in a just a few hours, mostly during one day! I was surprised that it wasn’t as bad as I thought it would be! It’s still not my thing though. Catherine is a bit more likeable than some Austen heroines, despite her being a bit naive and having a funny way of viewing the world. She likes reading gothic books, which is better than reading trashy romance novels, although they seem to give her strange ideas about the world, so she is convinced Mr Tilney’s father killed his wife! Obviously this would never happen in an Austen, but it still brings something different to the novel! She’s also a bit stupid when it comes to her so-called friend Isabella, who acts all lovely and then breaks off her engagement to Catherine’s brother and disappears. Catherine learns the hard way that you can’t trust everyone who wants to be your friend. I liked Mr Tilney from the start: he seems to be a perfectly nice chap. He is friendly and clever, and a good match for Catherine. 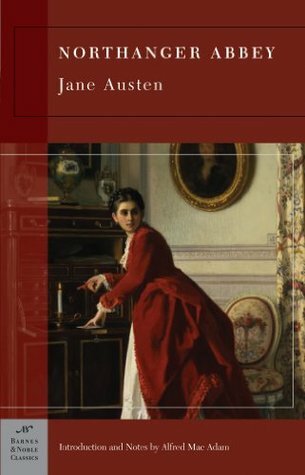 This novel may not have the clout of some of Austen’s other, more popular works, but it’s much easier to follow and isn’t as full of endless conversations between characters about which couples are going to get married and all that stuff. It’s a definitely a bit lighter and I suppose slightly more amusing as it is supposed to be a parody. I’m giving it 6/10 because it is interesting and it’s maybe a little more modern than Austen’s other novels: it has a gold-digger, fake friends, unwanted male attention, an over-active imagination and so on. It also kept me reading for a lot longer than the other novels! It’s still not something I would necessarily read again though!